What’s better than having great friends who fish you ask? 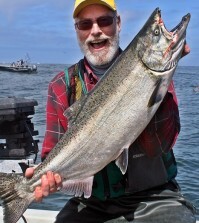 Having great friends who fish and share their catch! 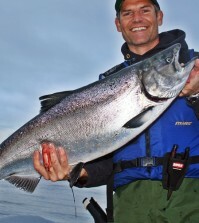 Call me lucky … my good friend Nelson gave me a beautiful fillet of Spring Chinook last week and now it was my turn to do something special with it. I thought about grilling the fillet… maybe some fresh vegetables to go with it but that lacked the “Wow!” for which I was searching. 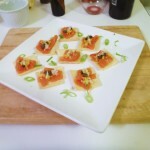 Then it hit me; I’m going to do 3 small dishes with the salmon being the star of each course. My quest for fresh produce took me to Whole Foods in Seattle. The produce manager was kind enough to share with me which items were at their peak and after pondering my options for 20 minutes, the menu started taking shape. 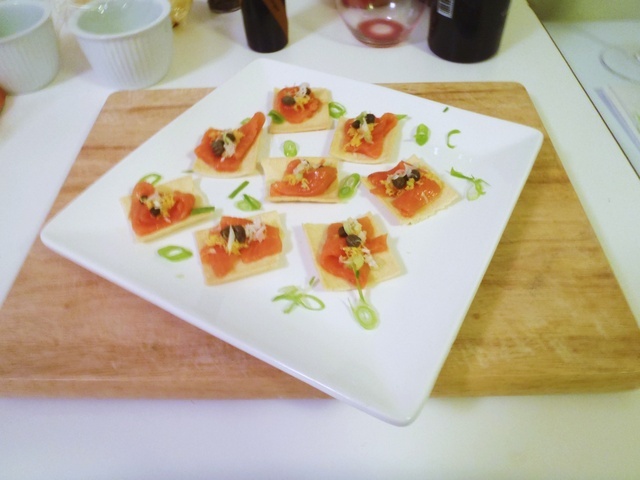 Sashimi Spring Chinook served on Sea Salt Crackers with lemon zest, capers and finely diced scallions, finished with Manni’s olive oil. The inspiration for this dish came to me when I was eating at Yellowtail in the Bellagio Hotel in Las Vegas. This dish is simple yet elegant and makes for great conversation when it is served. 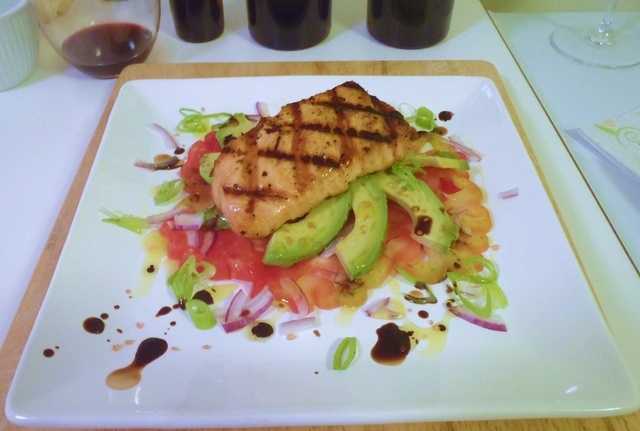 Seared Salmon belly with a sliced Heirloom Tomato, avocado and shaved red onion, dressed with Manni’s Olive Oil and Di Modena Gran Riserva Balsamic Vinegar. A simple dish to prepare. Season the salmon with olive oil, kosher salt and fresh cracked pepper then grill over high heat. To plate, start building the flavors with a layer of Heirloom tomato topped with thinly sliced avocado. Shaved red onions and diced scallions build the next layer of flavors. The fresh produce needs to be seasoned and now is the perfect time; fresh cracked pepper and pink Hawaiian Sea Salt will make the tomatoes and avocado come to life with flavor. 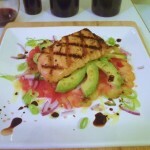 Top the dish with the Seared Salmon Belly then dress with the olive oil and balsamic vinegar. 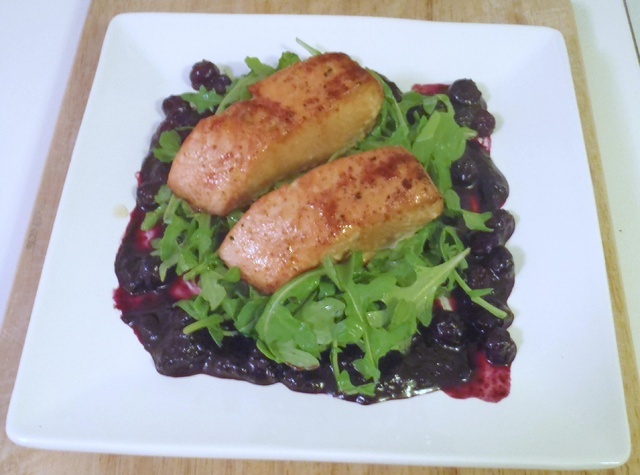 Spring Chinook fillet cooked on an Alder plank, basted with honey and cayenne pepper laid on a bed of baby arugula surrounded by a blueberry cabernet reduction. When I cook on an Alder plank, I soak the plank for about 30 minutes in water then place directly on the grill over medium high heat. 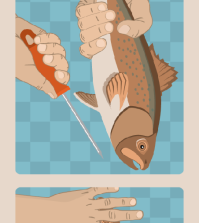 Once I start seeing smoke sneak out the lid, it’s time for the fish. Season the fillets with olive oil, Kosher salt, cayenne pepper and drizzle with a high quality honey. Cooking times will vary based on the temperature of the grill and the size of the fillets, so be careful to not overcook. To make the blueberry cabernet reduction, start by simmering blueberries over medium heat. After the berries soften up, add about 2 cups of a good Cabernet and reduce till the desired consistency is achieved. Add freshly grated ginger, kosher salt and honey to taste then let cool. 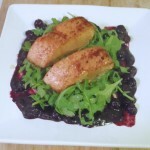 Place the reduction on the plate and top with seasoned baby arugula then crown the dish with the candied salmon fillet.